Yesterday, after a week-long occupation of the Jenpeg Generating Station, representatives of the Pimicikamak Cree of Cross Lake brought their protest to Winnipeg. 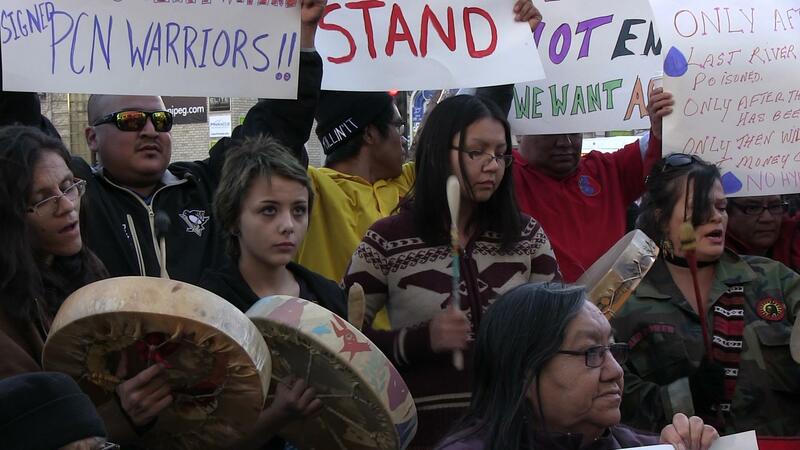 Community members and local supporters rallied at Manitoba Hydro’s downtown headquarters to pray, sing and tell their story to Winnipeg media. They began with a prayer and followed with a moment of silence and an honour song for Cpl. Nathan Cirillo, the young reservist murdered in the recent attack on Parliament Hill. Then representatives explained what led the community to evict Hydro staff from the Jenpeg housing complex and to occupy the generating station. In a statement circulated on her behalf, Chief Cathy Merrick invites Winnipeggers to empathize.